Rothorn 3’100 metres / 10’170ft. 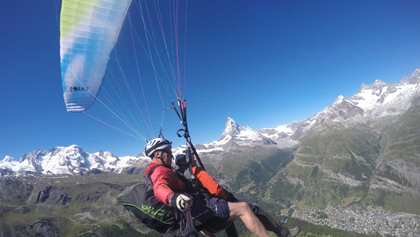 The Rothorn is the classic paragliding mountain in Zermatt. The take-off point can be reached from the cable car station Rothorn in just a few minutes walking. In winter it is possible to take off from Rothorn the whole day. In summer it is recommended to take off early in the morning, because later on in the day there might be strong turbulence. The rock faces around the Rothorn often give very good thermals which allow paragliders to rise. 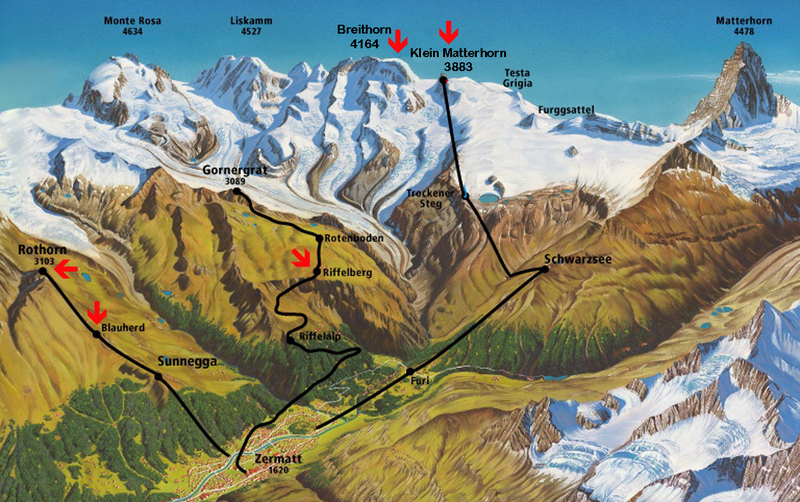 The flight leads over the stations Blauherd and Sunnegga to Zermatt with a vertical drop of 1’500 meters / 4’921 ft. Flight Time: Approx. 20 minutes. For technical reasons the cable car to Rothorn will be closed this summer. Riffelberg 2’582 metres / 8’471 ft.
With the legendary Gornergrat Train you will reach Riffelberg. From there in a few minutes walking you will reach the take-off point. 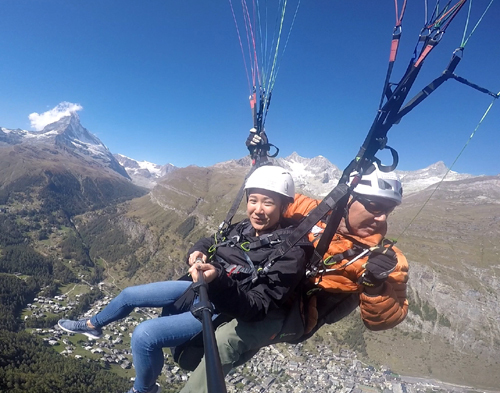 Alternatively you can ride first of all to the Gornergrat to enjoy the view of the glaciers and highest peaks of the Alps. If you like it a bit sportier you can hike back to Riffelberg in about 1 hour. If you prefer to take it easy you can ride with the train back to Riffelberg. The flight leads us over Riffelalp and across the valley of Zermatt with a fantastic view of the Matterhorn. Only in summer and autumn. Blauherd 2’400 metres / 7’874 ft.
From 26thMay until 17th June 2016 the take-off point can be reached with a little hike of about 20 minutes from Sunnegga. From 18th June till 2nd October 2016 it takes about 10 minutes from Blauherd. With good conditions the flight leads over Sunnegga where very often good thermals can be found to gain more height. From there the flight goes towards to Zermatt. There you can try to steer the paraglider and to do circles. Klein Matterhorn 3’880 metres / 12’730 ft. The Klein Matterhorn is the highest cable car station in the Alps. You will notice very quickly that there is less air which makes your breathing harder. The whole station is surrounded by glaciers. From there you can enjoy an unbelievable view to the highest mountains in Switzerland, Italy and France. You can even see Mont Blanc, the highest mountain in the Alps. The take off-point is right next to the cable car station. From there we fly to the marvellous world of the glaciers. You will see mountaineers on the Breithorn and below your feet the glaciers with their crevasses. Only very few people in the world are so privileged to fly in such high altitudes with a paraglider. Flight Time: Approx. 35 minutes. Breithorn 4’164 metres / 13’661 ft.
Perhaps you would like to climb a four thousand meter peak. With the Breithorn you will find the ideal mountain. The summit can be reached from the cable car station Klein Matterhorn in about 1 hour 45 minutes. For the climb you don’t need prior knowledge. After the climb all people have to walk back. All people? No, we don’t have to walk back, because we have our paraglider with us. With good conditions the take-off is right from the summit over the 1000 metres / 3’280 ft. high north face. 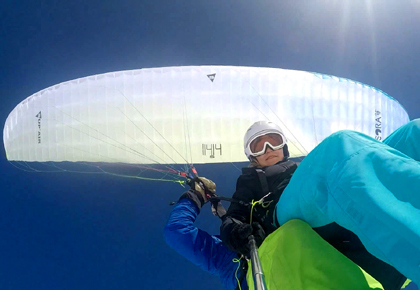 With some luck there are some dynamic up-winds which allow us to fly along the ridge of the Breithorn and from there you can watch the jealous faces of the other mountaineers. With not ideal conditions the take-off point is about 5 minutes lower down on the south side. With a turn to the right the flight leads us between Klein Matterhorn and Breithorn towards Zermatt. 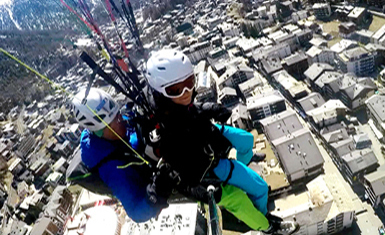 Only a few people have been fortunate enough to experience a paragliding flight from a four thousand metre peak. With guarantee this is an extraordinary experience. Flight Time: Approx. 40 minutes. * Cable car or train prices are not included. Ski Passes, Half Price Tickets or Swiss Passes can be used.